CHINHAE, Republic of Korea - U.S. Navy and Republic of Korea (ROK) Navy diving and salvage experts wrapped up nearly two weeks of advanced training during Salvage Exercise (SALVEX) Korea 2017, March 30. The bilateral exchange began March 21 and featured joint diving and salvage operations, both in-port and at-sea. During the underway phase, U.S Navy divers assigned to Mobile Diving and Salvage Unit (MDSU) 1 embarked on the salvage ship ROKS Tong Yeong (ATS 31) alongside their Korean Navy counterparts, a first for this annual exercise. The training focused on combined diving and salvage operations and subject-matter expert exchanges. Divers from both navies also operated together under complex, realistic training scenarios in waters near the Korean peninsula. These evolutions exemplified the merits of diving and salvage interoperability between the U.S. and ROK navies. "SALVEX enables our divers to become familiar with each other's equipment and capabilities, making it easier for us to work together in the future if a real world contingency operation were to happen," said Master Chief Diver Joshua Dumke. SALVEX 2017 marks the 33rd year of the bilateral SALVEX, dating back to 1985. The long-standing exchange has fostered supreme trust and deepened cooperation between the two navies. "We have a waiver to dive with Korean Navy systems," said Lt. Cmdr. Tim Emge, diving and salvage officer for Task Force 73. "This is a significant milestone. It gives us the ability to deploy divers with limited amounts of gear and perform interoperable dive operations with our partners." Emge said the complexity and the tangible value of the training scenarios get better each year due to the planning, teamwork and innovation of Sailors from both nations. "This exercise allows both navies to enhance our diving and salvage capabilities in a very meaningful way," said Emge. 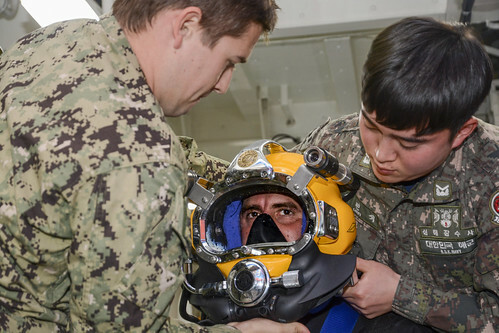 "Our partnership with ROK Navy divers has been a huge success." SALVEX Korea 2017 is part of Exercise Foal Eagle, an umbrella of regularly-scheduled, annual exercises that are the culmination of many months of planning and based on realistic training scenarios. The naval portion of the Foal Eagle exercises take place in international waters around South Korea and features a full spectrum of maritime operations. MDSU 1 provides combat-ready, expeditionary, rapidly-deployable mobile, diving and salvage capabilities to conduct harbor clearance, salvage, underwater search and recovery, and underwater emergency repairs in any environment. Commander, Task Force (CTF) 73 is U.S. 7th Fleet's theater security cooperation agent for South and Southeast Asia. The CTF 73 staff also coordinates diving and salvage operations across the Indo-Asia-Pacific on behalf of the U.S. 7th Fleet.